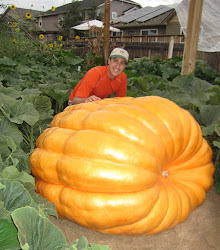 Giant Pumpkin Growing Tips From The Pumpkin Man: Got Fusarium in the Pumpkin Patch? Try Kelp & Silica. Got Fusarium in the Pumpkin Patch? Try Kelp & Silica. Here is an interesting excerpt from some studies using kelp and silica on cucurbit plants (the same family that Atlantic Giant pumpkins are in) to help battle fusarium. the results are interesting. "Crop losses due to Fusarium spp. are important to cucurbit growers along with an increasing interest in natural ways to improve disease resistance. Extracts of the brown seaweed, Ascophyllum nodosum and products containing silicon have both been shown to promote disease resistance on many crops. In a 2008 watermelon trial located in Upper Marlboro, MD, Fusarium solani symptoms were suppressed by extracts of Ascophyllum nodosum. At the final rating, 30% of the watermelon plants were dead from this pathogen in the control plots vs. 10% in Ascophyllum extract treatments. A second study was implemented in 2009 on Gladiator Pumpkins. Calcium silicate and Ascophyllum seaweed extract were applied to pumpkins grown in a field known to have Fusarium spp. infected squash three years prior. At the final rating, 24.6% of the pumpkin plants were dead in the control plots vs. 19.2% in the silicon plots, 13.6% in the Ascophyllum extract treatment, and just 6.1% in the plots with both calcium silicate and Ascophyllum extract. These field studies were further supported by two greenhouse studies where applications Ascophyllum extract to cucumber plants reduced incidence of Fusarium oxysporum and enhanced the activities of plant defense-related enzymes including chitinase, β-1,3-glucanase, peroxidase, polyphenol oxidase, phenylalanine ammonia lyase and lipoxigenase as well as elevated levels of total phenols compared to the control." If you think you've got the soil borne disease fusarium, try RAW Kelp and Silica in your pumpkin patch. I took some of my own advice and did a foliar and soil application of kelp, silica and humic acid this evening. I don't believe I have fusarium, but a little prevention goes a long way and like we've talked about on this blog before, kelp, humic acid and silica have a lot of other good benefits.